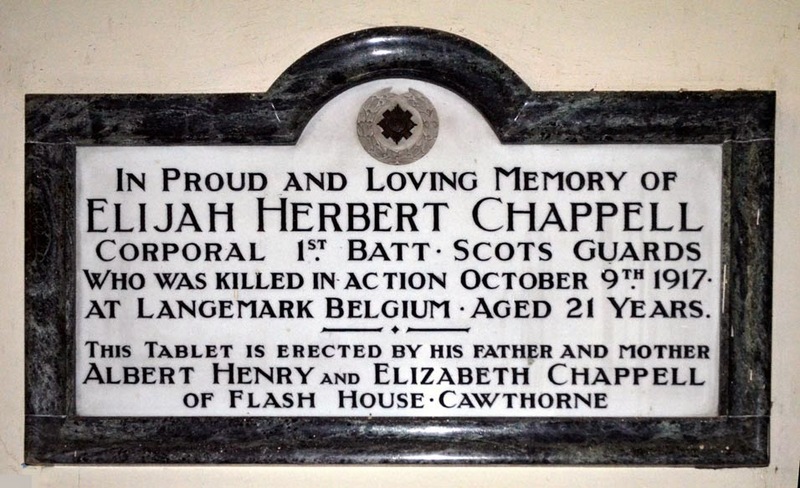 In Proud and Loving Memory of / Elijah Herbert Chappell / Corporal 1st Batt Scots Guards / who was killed in action October 9th 1917 / at Langemark, Belgium aged 21 years / This tablet is erected by his Father and Mother / Albert Henry and Elizabeth Chappell / of Flash House, Cawthorne. 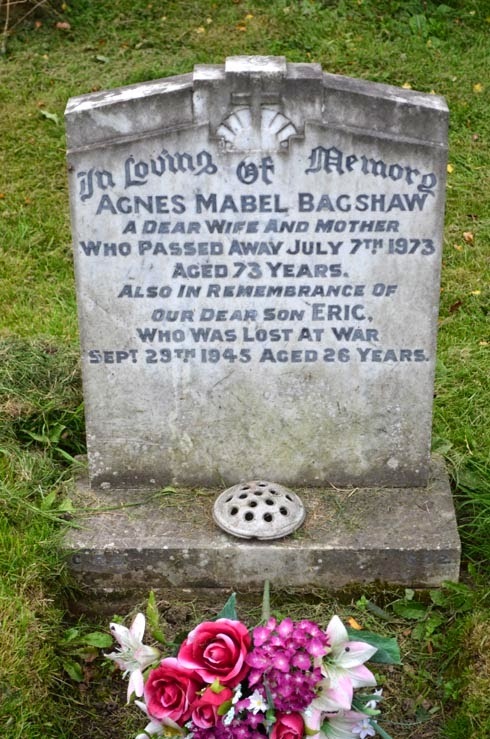 Read more about Elijah and the other men of Cawthorne in the Autumn 2014 edition of Memories of Barnsley. 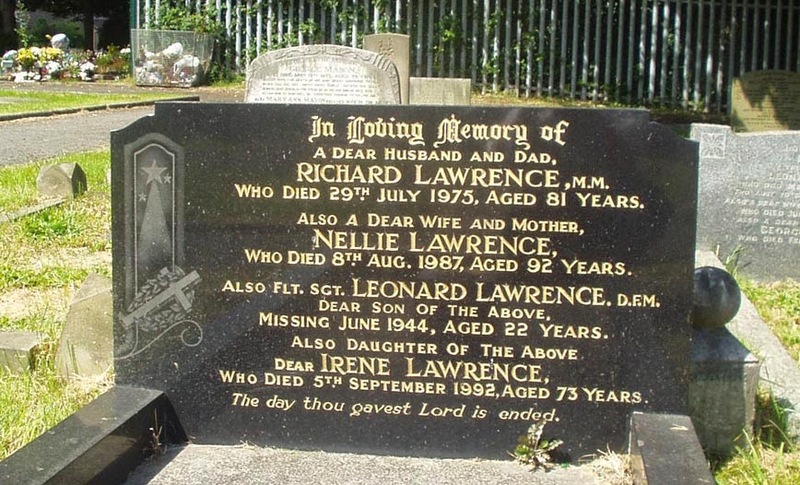 He is also remembered on the Cawthorne War Memorial. Elijah isremembered on the Tyne Cot Memorial in Belgium and commemorated on the Commonwealth War Graves Commission website. 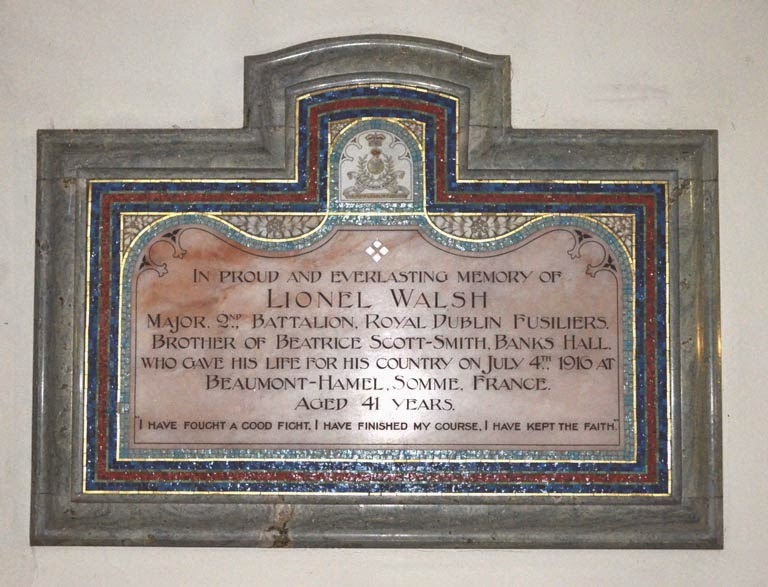 In proud and everlasting memory of / Lionel Walsh / Major 2nd Battalion Royal Dublin Fusiliers / Brother of Beatrice Scott-Smith, Banks Hall / who gave his life for his country on July 4th 1916 at / Beaumont-Hamel, Somme, France / aged 41 years / "I have fought a good fight, I have finished my course, I have kept the faith." Major Walsh is also remembered on the Cawthorne War Memorial. He is buried in Beauval Communal Cemetery and commemorated on the Commonwealth War Graves Commission website. 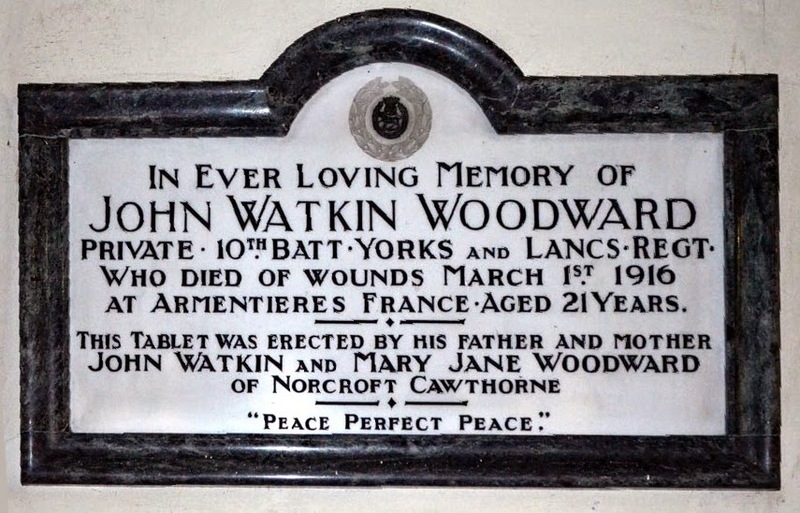 In loving memory of / John Watkin Woodward / Private 10th Batt Yorks and Lancs Regt / who died of wounds March 1st 1916 / at Armentieres France aged 21 years / This tablet was erected by his father and mother / John Watkin and Mary Jane Woodward / of Norcroft Cawthorne / "Peace Perfect Peace". Read more about John W Woodward in the Autumn 2014 issue of Memories of Barnsley. John is also remembered on the Cawthorne War Memorial. He is buried in the Cite Bonjean Military Cemetery, Armentieres, France cemetery and commemorated on the Commonwealth War Graves Commission website. The Autumn issue of Memories of Barnsley came out last week and contains some great articles about the First World War, and another about a church that was also of interest. Brian Elliott writes about the concrete church at Goldthorpe, the church of St John the Evangelist and St Mary Magdalene - it was the first of its kind! We have photos of the beautiful war memorial there here. This is followed by a '100 years - Great War' themed piece on the 'Call to Arms' in 1914. It describes the call up and subsequent departure of the Barnsley Territorials on 6 August 1914. Acknowledgement is given to Jon Cooksey's book Barnsley Pals and another book Images of War - Flanders - 1915 is promoted as containing rare and previously unpublished photographs of the 5th York and Lancaster Regiment (Territorials). The article that really got me excited was the piece by Barry Jackson on 'Cawthorne 1914-1918'. 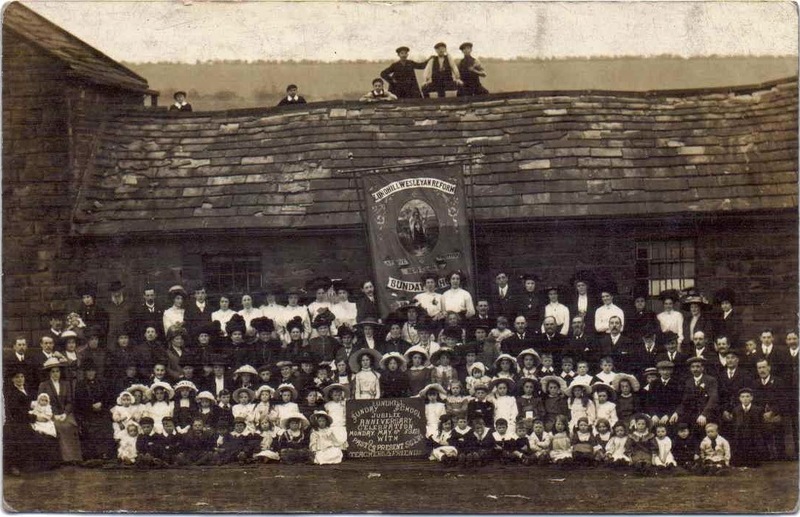 Six pages long and packed with photos of Cawthorne men Barry describes the experience of WW1 for Cawthorne for the men who left to go to war and for the people who remained at home. 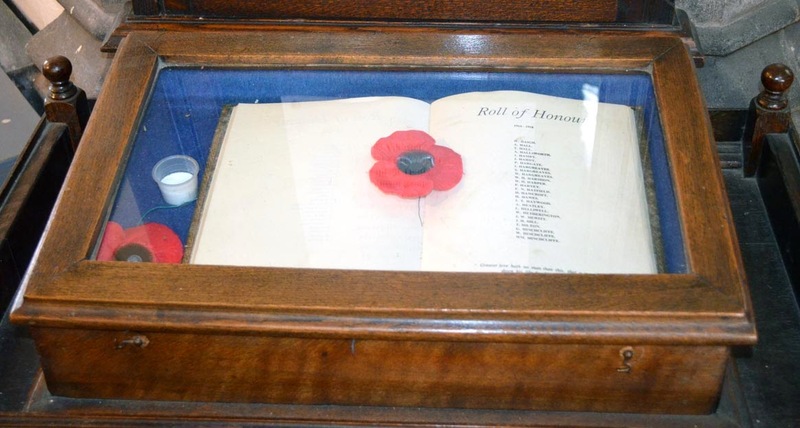 Names mentioned include men listed on the War Memorial outside the Cawthorne museum and many more. 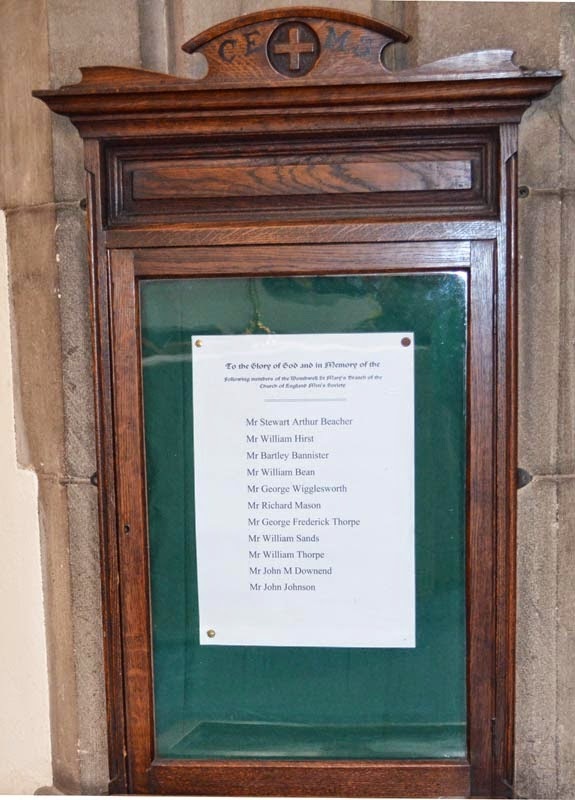 Barry also notes that there are individual memorials to three men in Cawthorne Church, John Watkin Woodward, Elijah Herbert Chappell and Lionel Walsh and another in the Methodist Church to Thomas Allott. Our Project Information Officer has been despatched to get photos for us! 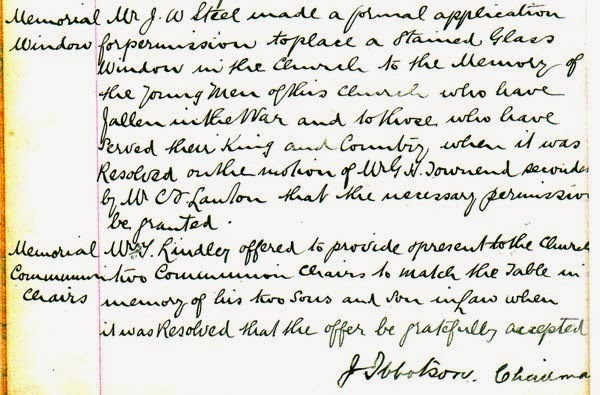 Finally, a piece by Andrew Horsfield on 'Horace Bramall, the first Silkstone casualty' describes Horace's early life at the Station Inn in Silkstone and his career in the Navy. His ship, the Aboukir, was sunk by a German submarine on 22 September 1914. 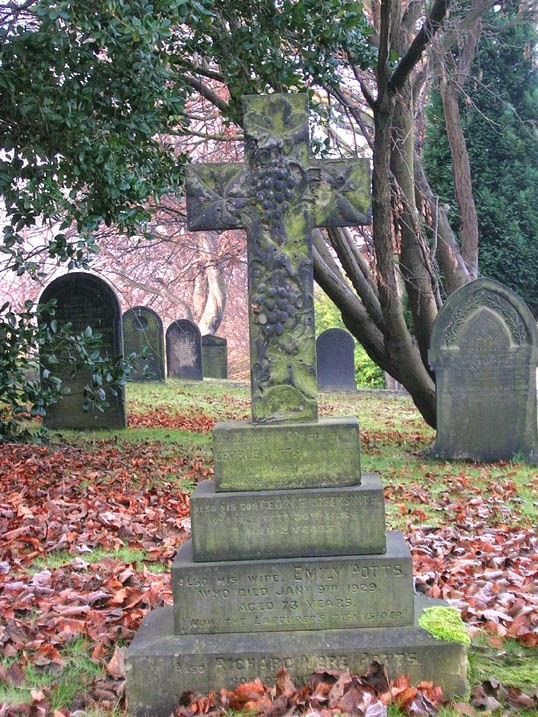 Horace is remembered on Silkstone War Memorial and on the Silkstone Remembers website here where more information about his family can also be found. Andrew acknowledges the information supplied by members of the Bramall family and by Heritage Silkstone. Another great issue of this magazine. We look forward to many more First World War stories in the months to come. Recommended! 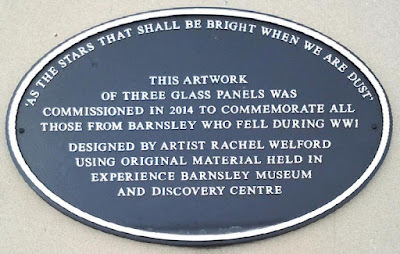 Three glass panels designed by Rachel Welford. The artwork will be officially dedicated on Thursday 25 August at launch of the Road to War exhibition at Experience Barnsley. An oval blue plaque on a white stone plinth appeared near to the panels some months later. A news release about the panels can be found here. 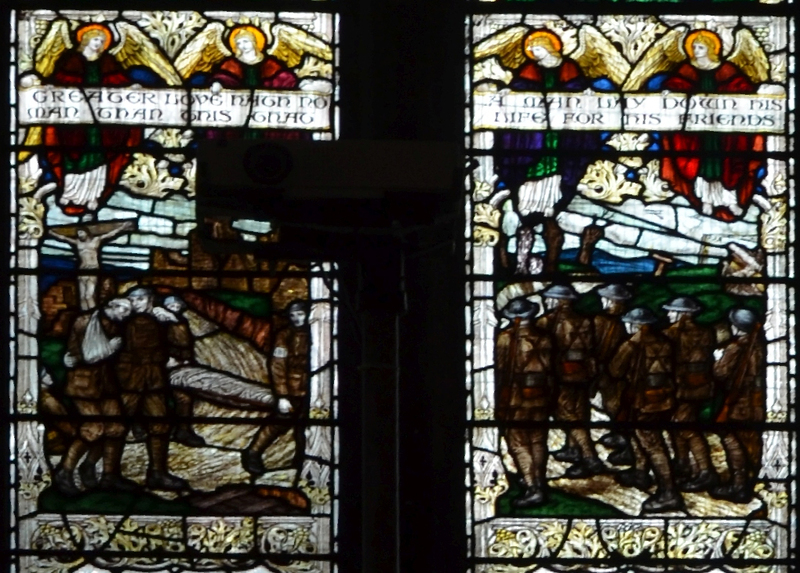 Edward is also remembered on the Wombwell War Memorial, St Mary's Church. 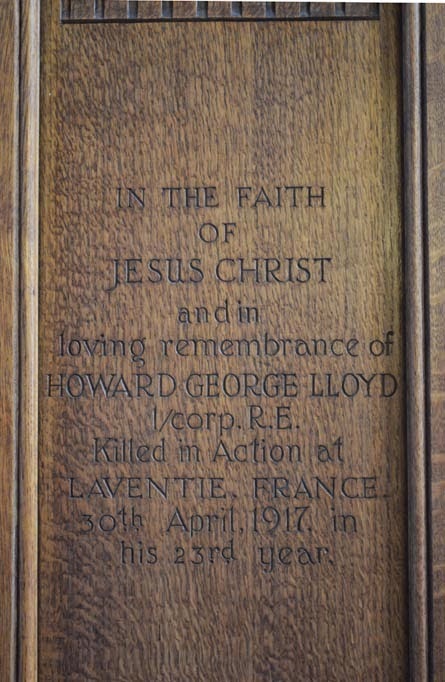 He is remembered on a memorial in St John the Baptist's Church in Penshurst, Kent too, which seems to be connected to his family. He is remembered on the Pozieres Memorial in France and commemorated on the Commonwealth War Graves Commission website. 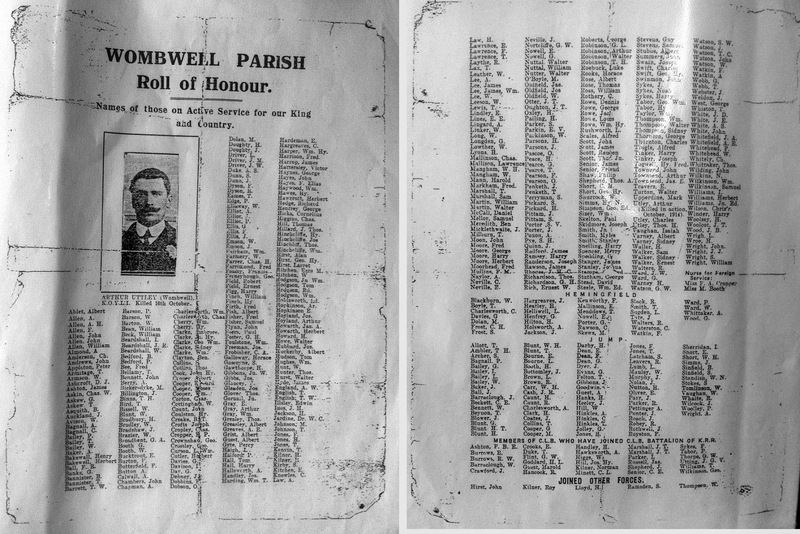 Six of the eleven names also appear on the Wombwell War Memorial in surname and initial only format, so this memorial gives added information to help identify these men. 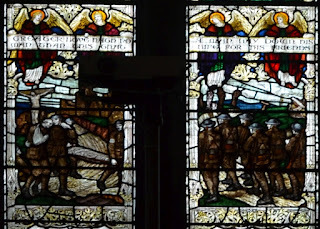 The memorial, "named as a memorial to L/Cpl HG Lloyd needs expanding as the Faculty is for a 'side chapel' 'As a memorial to the Chuch Lads' Brigade members who fell in the War' and to be used as a morning church. Erected in 1927 but has been moved at least three times. The side chapel was for many years on the North side of the Nave near the original organ loft. The chapel was moved to its present position as a porch [...] in the mid 1980's before I got to grips with research on the War memorial, it was after visiting the Sheffield Archives to look at the faculties for Wombwell hoping to find an original list of names on the memorial which is built on church land, that I discovered it was as a memorial to all ex CLB members of Wombwell who had died in the great War. He is is buried in Laventie Military Cemetery in France and commemorated on the Commonwealth War Graves Commission website. 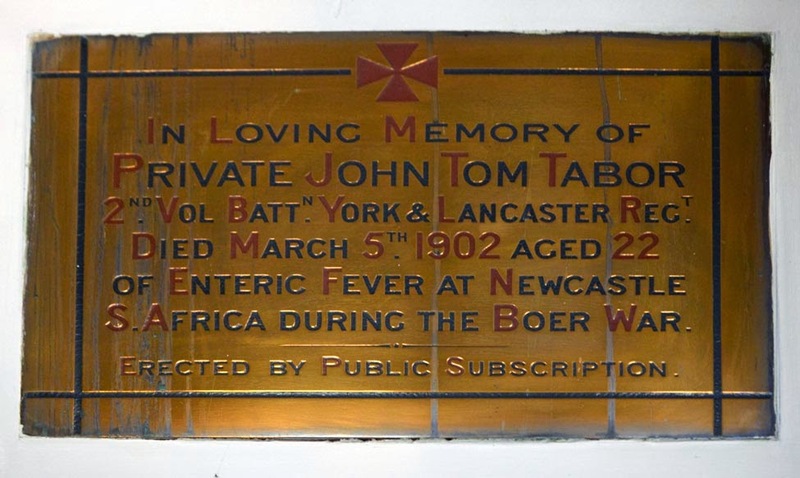 In Loving Memory of / Private John Tom Tabor / 2nd Vol Battn York & Lancaster Regt / Died March 5th 1902 aged 22 / of Enteric Fever at Newcastle / S. Africa during the Boer War. / Erected by Public Subscription. 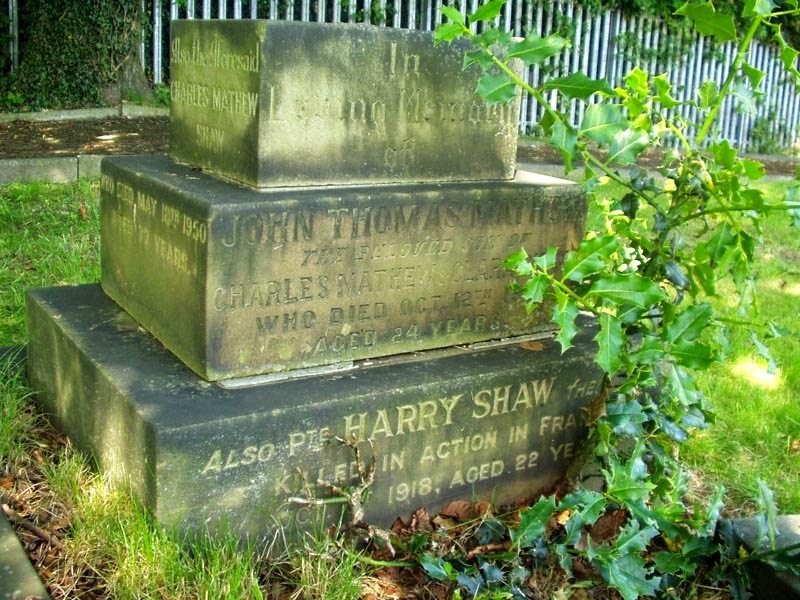 John Tom Tabor is also remembered on the Darfield, All Saints Church, John Tom Tabor - plaque and on a family gravestone in Wombwell Cemetery. Also James their son Killed in Action June 28th 1944 / aged 25 years. James is buried in the Hottot-Les-Bagues War Cemetery in Calvados, France and commemorated on the Commonwealth War Graves Commission website. 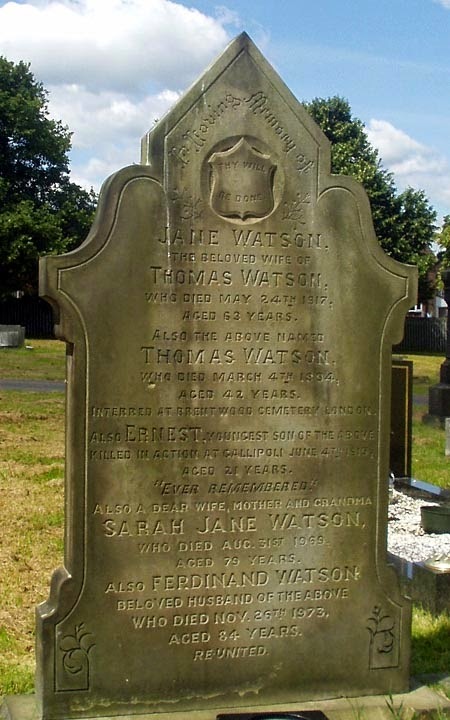 In Loving Memory of / Jane Watson / the beloved wife of / Thomas Watson / who died May 24th 1917 / aged 63 years / Also the above named / Thomas Watson / who died March 4th 1894 / aged 42 years / Interred at Brentwood Cemetery, London / Also Ernest, youngest son of the above / Killed in Action at Gallipoli June 4th 1915 / aged 21 years / "Ever Remembered" / Also a dear wife, mother and grandma / Sarah Jane Watson / who died Aug 31st 1969 / aged 78 years / also Ferdinand Watson / beloved husband of the above / who died Nov 26th 1973 / aged 84 years / Re-United. He is remembered on the Helles Memorial in Turkey and commemorated on the Commonwealth War Graves Commission website. 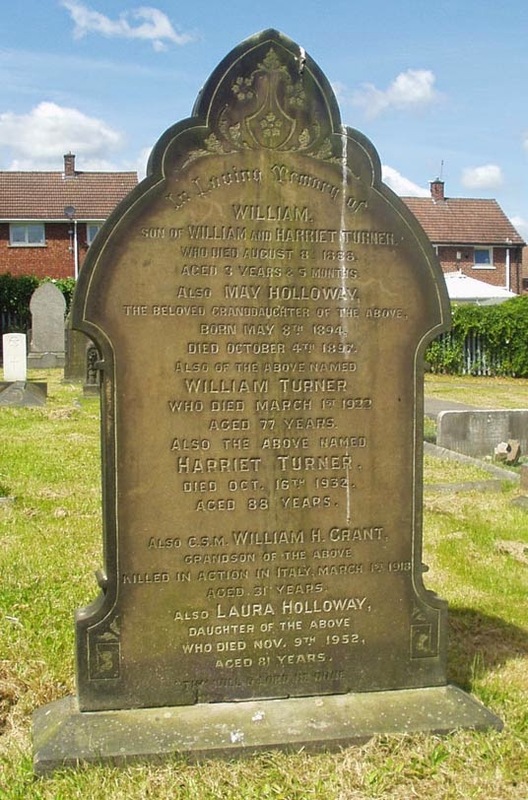 In Loving Memory of / William / son of William and Harriet Turner / who died August 8 1888 / aged 3 years & 5 months / Also May Holloway / the beloved granddaughter of the above / born May 8th 1894 / died October 4th 1897 / Also of the above named / William Turner / who died March 1st 1922 / aged 77 years / also the above named / Harriet Turner / died Oct 16th 1932 / aged 88 years / Also C.S.M. William H Grant / grandson of the above / Killed in Action in Italy, March 1st 1918 / aged 31 years / Also Laura Holloway / daughter of the above / who died Nov 9th 1952 aged 81 years. 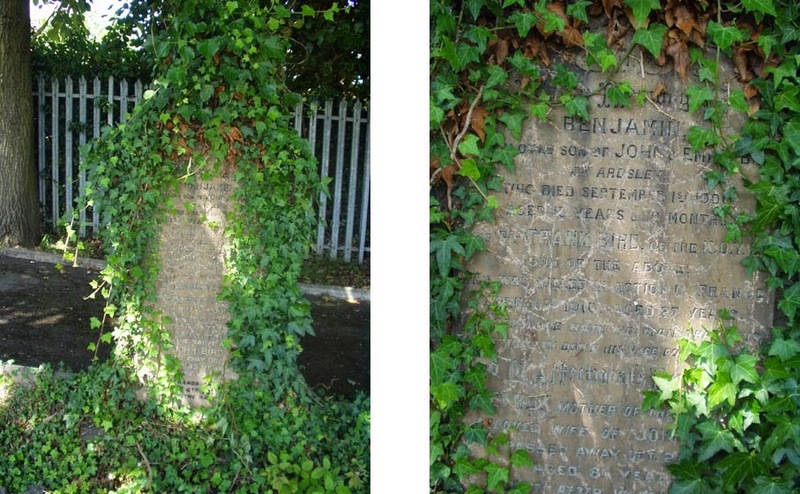 / "Thy Will O Lord Be Done"
William is also remembered on the Hoyle Mill Scholars, Bethel Chapel, Pontefract Road, Hoyle Mill and on Barnsley, St Peter's Church, Doncaster Road memorials. He is buried in the Giavera British Cemetery, Arcade in Italy and commemorated on the Commonwealth War Graves Commission website. The building that was the Blucher Street United Methodist Church is now the Hope House Church and School. 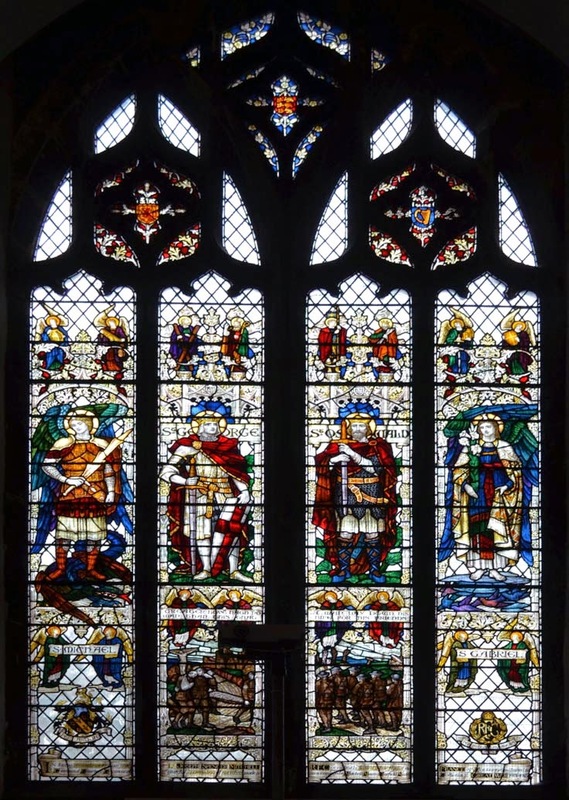 There is a possibility that the Memorial window mentioned in extract from the Minute books of the Methodist Church might still exist. We are making enquiries. Beneath that is an entry referring to two memorial chairs - these were presented to the church later in 1919 in memory of Foster Lindley, Frank Marcus Lindley and Claude Scott, who are also remembered on a War Memorial gravestone in Barnsley Cemetery. The window was unveiled at the same time. "To the Glory of God - Dedicated by this Church in loving memory of its fallen, and in grateful tribute to all who served in the Great War, 1914-1919"
In Loving Memory of / John Thomas Mathew / the beloved son of / Charles Mathew and Clara Shaw / who died Oct 12th 1918 / aged 24 years / Also Pte Harry Shaw their __ / Killed in Action in France / Oct 1st 1918, aged 22 years / Also the aforesaid / Charles Mathew Shaw / who died May 18th 1950 / aged 77 years. 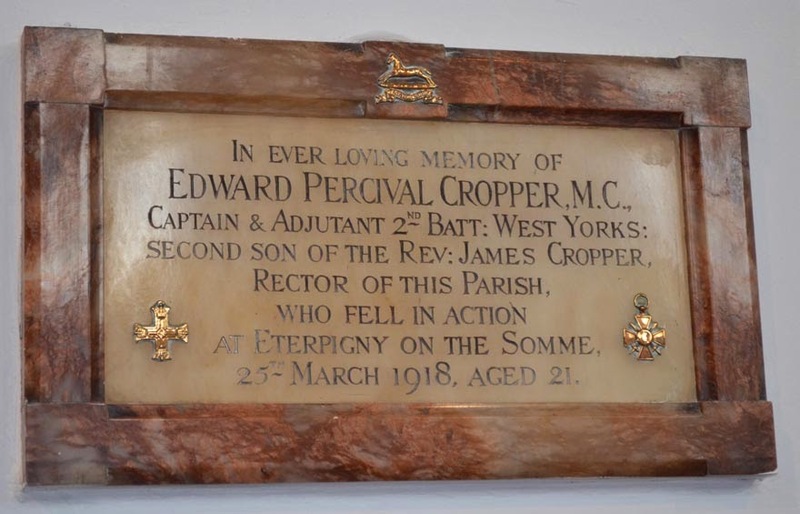 He is also remembered on the Ardsley, Christ Church, Christ Church Parishioners - WW1 Plaque. Harry is buried in Sucrerie Cemetery, Epinoy, France and commemorated on the Commonwealth War Graves Commission website. 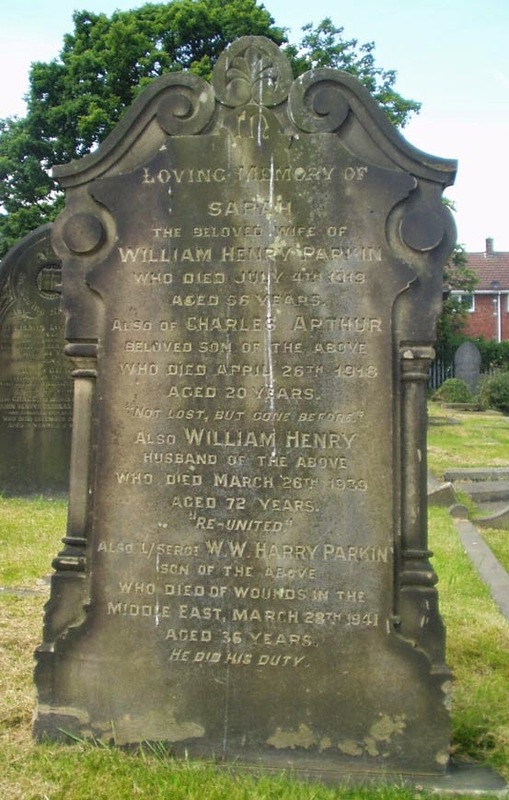 Henry Thompson / who died November 21st 1899 / aged 41 years / Also Sarah Ann Thompson / the beloved wife of the aforementioned / who died March 27th 1920 / aged 59 years / Also their dearly beloved son / James Edward Thompson / who was killed in Action in France / Octr 9th 1917 aged 30 years / With Christ which is far better / Also Annie Brook / sister of the aforesaid / who died Feb 20th 1939 / aged 74 years. 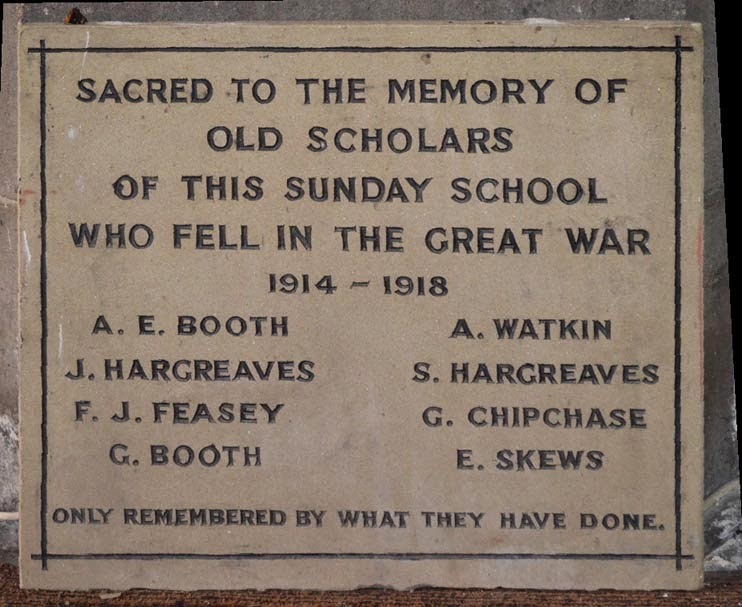 and the Ardsley, Christ Church Parishioners - WW1 Plaque. He is remembered on the Tyne Cot Memorial in Belgium and commemorated on the Commonwealth War Graves Commission website. 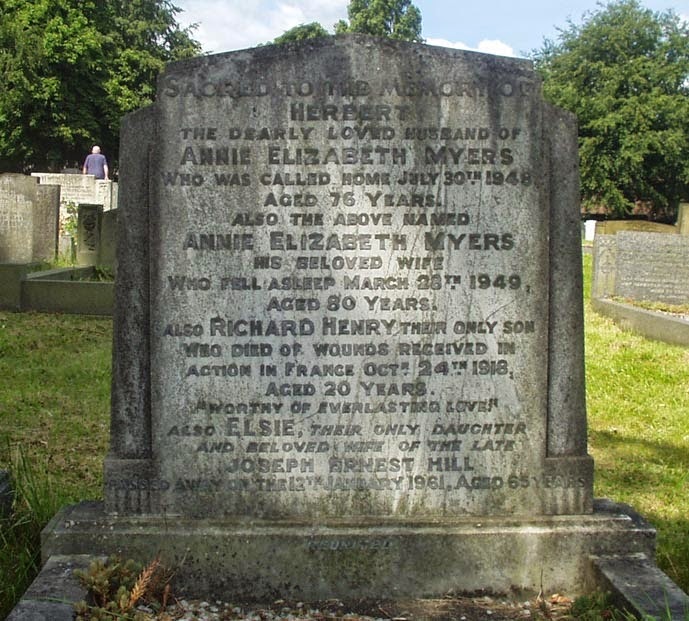 Sacred to the Memory of / Herbert / the dearly loved husband of / Annie Elizabeth Myers / who was called home July 30th 1948 / aged 76 years / Also the above named / Annie Elizabeth Myers / his beloved wife / who fell asleep March 28th 1949 / aged 80 years / Also Richard Henry their only son / who died of wounds received in / Action in France Octr 24th 1918 / Aged 20 years / "Worthy of Everlasting Love" / Also Elsie, their only daughter / and beloved wife of the late / Joseph Ernest Hill / passed away on the 12th January 1961 aged 65 years. He is buried in the Ovillers New Communal Cemetery, Solesmes, France and commemorated on the Commonwealth War Graves Commission website. 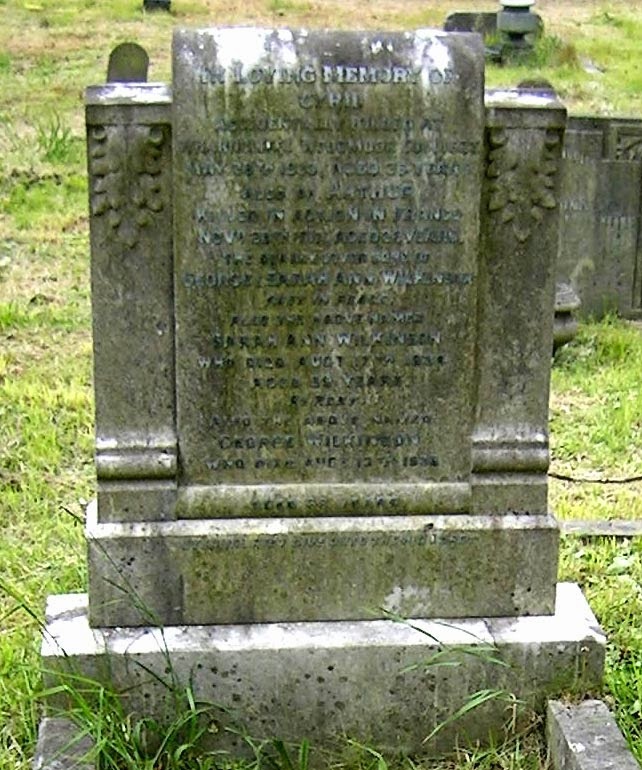 In loving memory of / Cyril / Accidentally killed at / Wharncliffe Woodmoor Colliery / May 26th 1933 aged 26 years / Also of Arthur / killed in France / Novr 23rd 1917 aged 26 years / The dearly loved sons of / George & Sarah Ann Wilkinson / Rest in peace / Also the above named / Sarah Ann Wilkinson / who died Augt 17th 1934 / aged 59 years / At rest / Also the above named / George Wilkinson / who died Augt 13th 1936. He is buried at Spoilbank Cemetery, Ieper, Belgium and commemorated on the Commonwealth War Graves Commission website. 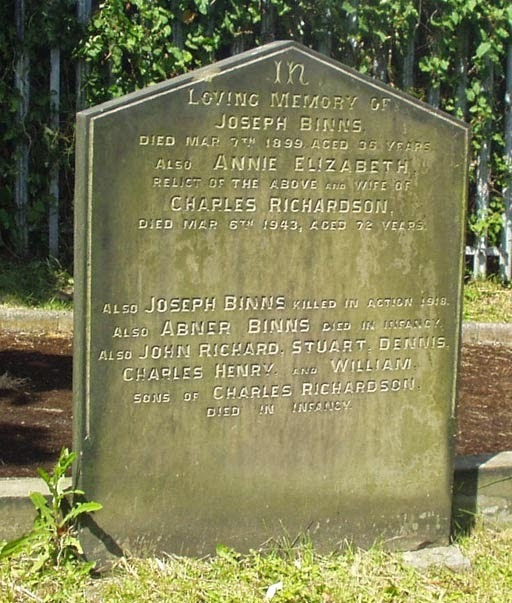 Also Tom Son-in-Law of the aforesaid / and dearly loved husband of Mary Bennett / killed in Burma March 2nd 1945 Aged 34 years / Also the aforesaid / Eleanor Pickering / who died Jan 10th 1958 aged 70 years. Tom is also remembered on the Ardsley, Christ Church, Christ Church Parishioners - WW2 plaque. Tom is buried in the Taukkyan War Cemetery in Myanmar (previously Burma) and commemorated on the Commonwealth War Graves Commission website.